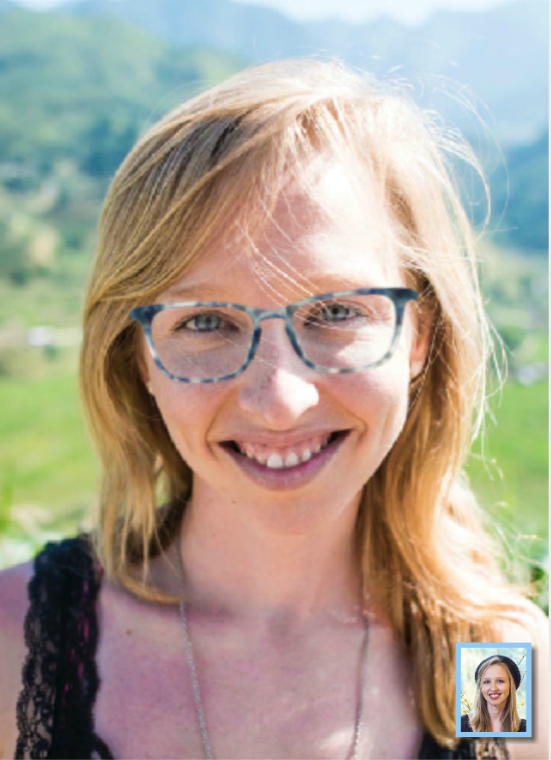 Warby Parker Review: Should You “GET EXCITED” About Home Try-on for Glasses? 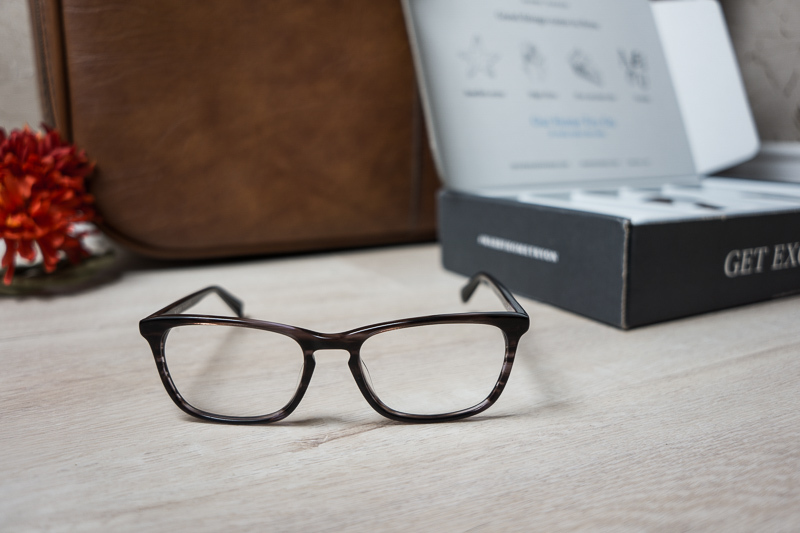 Browse: Home » Warby Parker Review: Should You “GET EXCITED” About Home Try-on for Glasses? 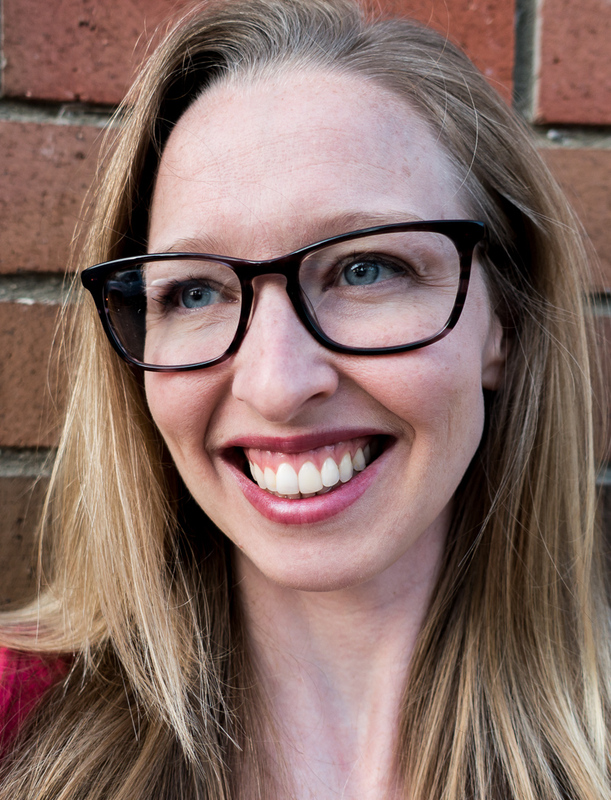 For those new to the home try-on scene, let me introduce you to Warby Parker. 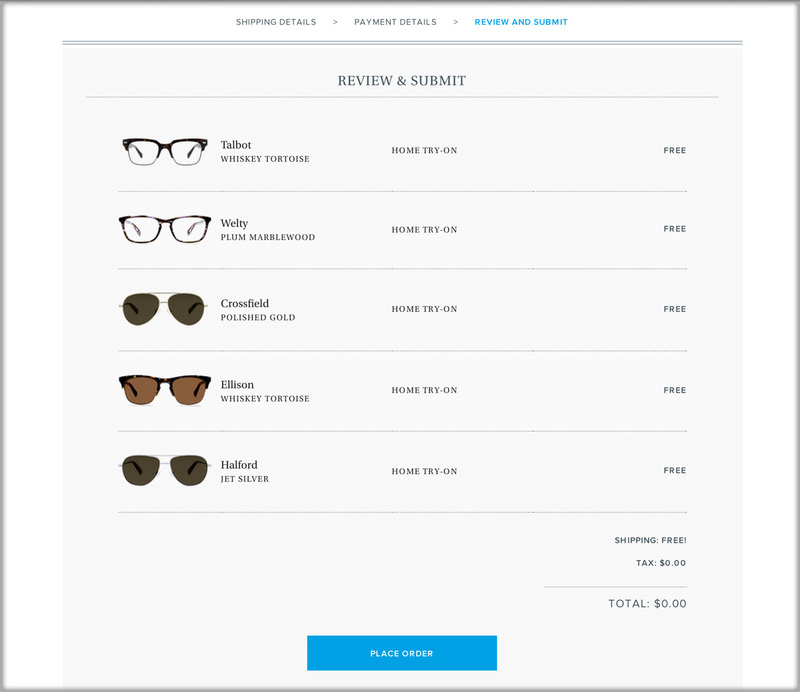 Warby Parker offers a unique model for glasses shopping: home try-on. You pick 5 styles you want to try, they pack them and ship them, and when they arrive you’ve got 5 days to try them before sending them back. It’s simple. 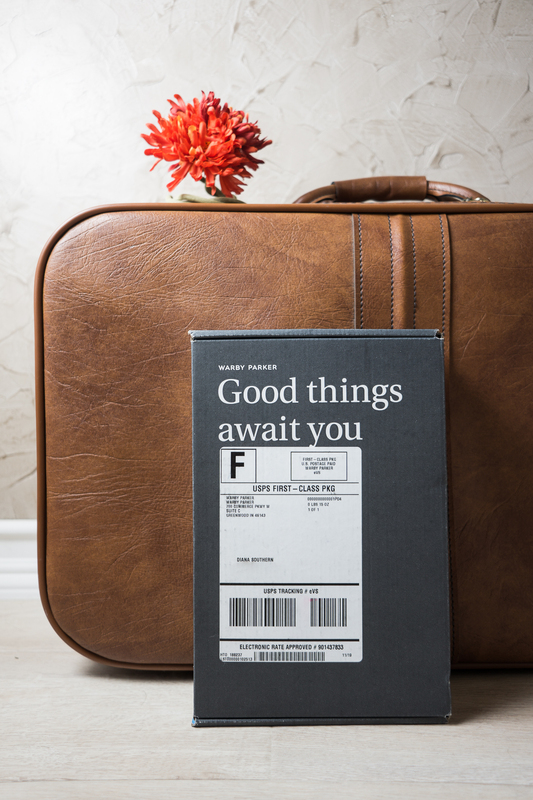 But really, do “good things await you?” Should you actually “GET EXCITED” like it says on their box? 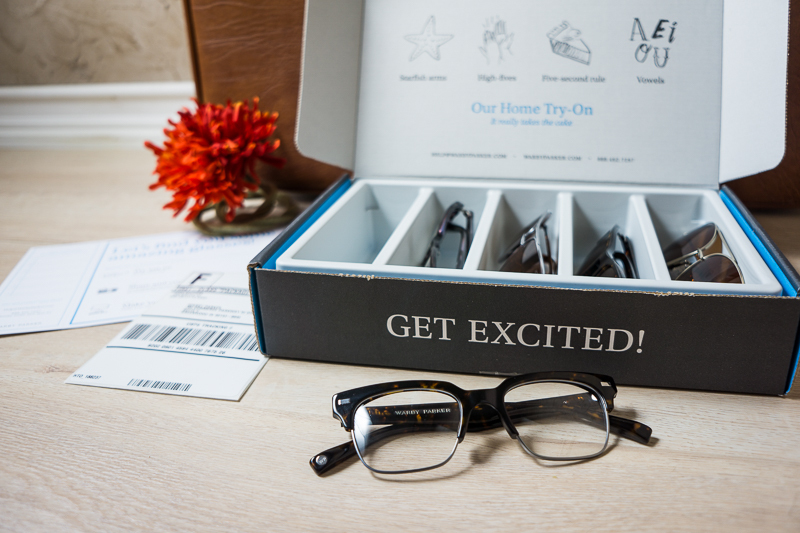 We’ve tested the Warby Parker home try-on service to find out for ourselves. 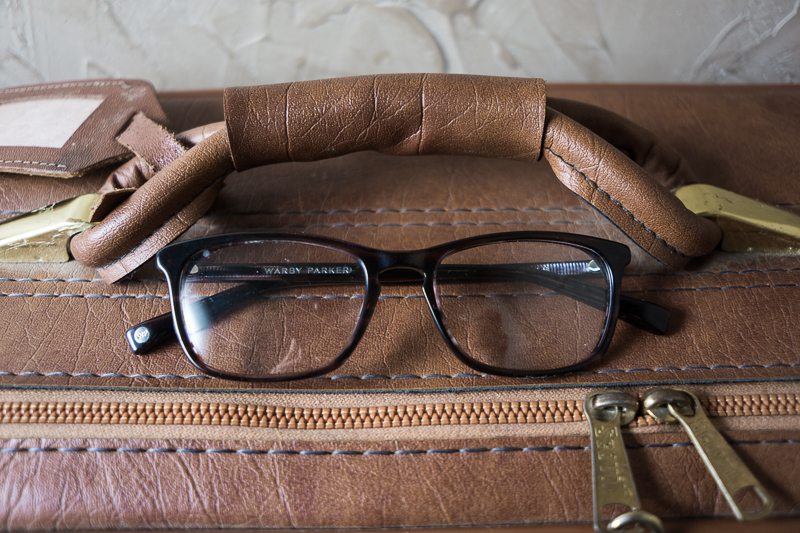 Read on to see how home try-on works and what we experienced in our quest for new glasses. 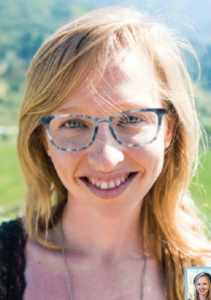 Warby Parker makes selecting frames a fun, simple process with a website that’s easy to navigate and a large selection of stylish frames. I think five is a good amount for home try-on; it’s not an overwhelming number, but it’s enough for you to get an idea of what styles you like best. And if you don’t find the perfect pair in you first box, you can use their service again. I’ve now tried it twice to make sure I really loved my top choice for glasses, and I had space to sample a few sunglasses in my second box. My box arrived on a Saturday, and with 5 business days to try, I had plenty of time to decide what I liked. Last time I tried 5 pairs of glasses, so it really worked perfectly to wear a different pair each day to see how other people react to each style. I’m a contact wearer with a STRONG prescription, and I don’t typically wear glasses during the day. It was pretty funny seeing each person’s reaction (or lack thereof) to me wearing glasses. Since I’d gone through one round of glasses before — sampling Dale, Duval, Ainsworth, Welty, and Walker — this time I opted to compare one significantly different style of glasses (Talbot) to my round one favorite (Welty). I used my remaining three slots to sample their sunglasses. On Friday, Warby Parker sent me an email reminding me it was time to send my box back. Return shipping is easy. You just reseal the box they came in, place the included label over the old one, and send it back via USPS. The box just barely fit in my mailbox. (Yay!) If you’re not comfortable leaving it in an unlocked box of course you can drop it off at the post office instead. THE GLASSES — I really liked the glasses I tried in my first home try-on round. All the frames were well-made and lightweight, so they didn’t feel bulky on my face even though they’re much larger than my current glasses. I liked the Welty frames best of all the optical frames I tried. THE SUNGLASSES — I didn’t much care for the sunglasses, mostly because of the lenses. The color tint was a little strong, and they really didn’t protect my eyes enough from the sun — I was still squinting when wearing them. And the styles I really wanted to try aren’t available for home try-on. I hope they expand their sunglasses home try-on in the future to include the Teddy, Quentin, Marple, Clara, and Julia. 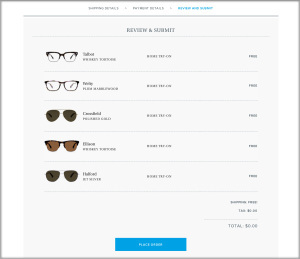 OVERALL — I’m impressed with the Warby Parker glasses selection, but I’m still unsure about the sunglasses. 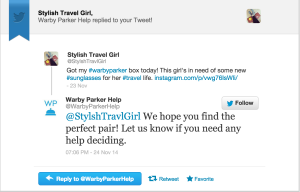 HELPFUL SOCIAL MEDIA SERVICE — @WarbyParkerHelp offers help choosing the best pair for you on Twitter. I tweeted back at them on December 1 (right after Thanksgiving weekend) and unfortunately never got a reply, but I’m not holding it against them since I forgot to use their hashtag #WarbyHomeTryOn. (Attempt #2 is going out on Facebook today.) They’ve also got their own YouTube channel, which I’d argue is more useful in general. Check out their Home Try-On Suggestions playlist. 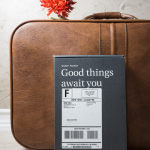 IT’S NOT PERFECT — a missing email… There were a couple things that haven’t gone quite right in my experience with Warby Parker’s home try-on service; none are a big deal at all, but if you want to get nit-picky, keep reading here. Going back through my emails, I found that both times I used the home try-on service, their auto “Right on track” email (sent to inform me that my order had shipped) says, “We’ll be in touch as soon as your package arrives.” I’m not sure what this mystery email entailed, but I never got either one — and trust me, I’m familiar with spam filtering. The next email I got was my reminder that it was time to send my glasses back. But I’m pretty sure I had all the info I needed inside the box, so no sweat there. The other blip in perfection was that the tracking link in their “Right on track” email tells you you’ll have 5 business days to try the glasses, but WP’s notification system didn’t seem to factor in the Thanksgiving holiday that occurred during my try-on period, and it notified me on Friday that I should send my box back. I figured all was well and sent it back on Monday anyway, later finding that that’s exactly what they expect you to do. Again, no big deal. Just a tiny blip in communication. OVERALL — I say thumbs up for the service as a whole. It’s free, easy and there’s a social aspect about their home try-on that you can reach out to if that’s your thing. Definitely recommend. Not all frames and colors are available for home-try on. If you ask me, there’s really no reason not to try Warby Parker if you live in the U.S. 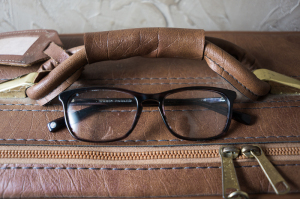 Whether you want prescriptive or non-prescriptive glasses, they’re selling a high quality product here and giving you the chance to try them in the comfort of your own home… and life. If you decide to buy, it’s a purchase you can be confident in because you’ve already tested the styles yourself in your everyday surrounding. It’s a pretty neat business model. I’m a fan. Just when I thought I’d decided on the Welty style, I discovered a third color option. I’m not certain, but I think Warby Parker just added this new color for the Welty frames. I’d settled on the plum marblewood, but now I’m wondering if marine pebble would look better. At least this shows they’re keeping their selection fresh. Since the blue frames aren’t available for home try-on, I’ve resorted to their virtual try-on to choose a color. What do you all think? Do we like pebbly blue (left) or marble-y purple (right)? Great article, but I felt I should mention that Warby Parker’s home try-on is actually NOT available in Canada, much to my dismay. What a bummer! Thanks for letting me know, J. I’ll update the article soon! Thank you so much! This was a very helpful review! Very informative, fun to read, and a quality blog post. I like WP but kind of feel they are overhyped. There are a lot of online stores that have frames that are just as good quality for less. EyeBuyDirect specifically. There are a few retailers based in Canada that do home try-on and will ship there I believe. BonLook does it I think. What frames did you end up getting Diana? Thanks for the info. It’s good to know about other online options for buying glasses. I opted for the plum frames, and I really like them! Mine actually took a full week to arrive. I ordered on a Friday and got an email confirmation saying they’d ship in two business days. Then on the following Thursday I got an email saying it had shipped (4 business days), and my package arrived two days later (on Saturday). So it could be faster, for sure.